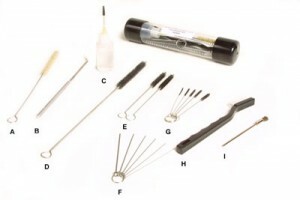 This kit has the basic brushes and micro brushes for general gun maintenance. Good for gravity, touch up and siphon guns. This kit has the basic brushes and micro brushes for general gun maintenance and servicing. Good for gravity, touch-up and siphon guns. 19 pc. kit comes in a clear plastic tube for easy storage. Items are packed in a convenient flip top plastic case. This kit is designed to provide you with the necessary specialized tools to clean every area of your HVLP spray gun or pressure pot system. An absolute must for maintaining your gun properly. 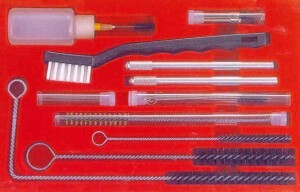 This system is the one used by professional repair and rebuilding shops. The 5 piece Mini-Brush set in all the Cleaning Kits above gets the most use. Customers asked for replacements so here they are – 5 replacement mini-brushes on a ring. O-Ring Removal Tool is an absolute must for removal of o-rings and seals without damaging gun body or threads. Offset design with grip.